Do you get your car serviced by the salesperson who sold it to you? We didn't think so. So then why would you ask a salesperson to adjust your next fountain pen? Right. You wouldn't. 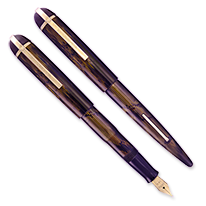 Don't risk the luck of the draw with your purchase when you can get it right the first time from people who know fountain pens inside and out. That would be us, the people of Indy-Pen-Dance.